Pre-Registration Required for ALL classes postmarked by June 30, 2019. All students pay a flat registration fee to take up to 6 classes. The class fee goes 100% to the instructor for materials and teaching of their respective classes. After July 1st, please contact osageriveralpacas@gmail.com or call 309-838-8825 for class availability and total amount due. Students learn basic crochet stitches and leave with a crocheted face cloth in their choice of pattern. All materials are provided. Tunisian Crochet is sometimes called the “link” between knitting and crochet. Also called Afghan Crochet, Tunisian Crochet combines elements of knitting and crochet for items that are fun to make and beautiful to wear – from lacy, airy fabrics to incredibly dense fabrics. 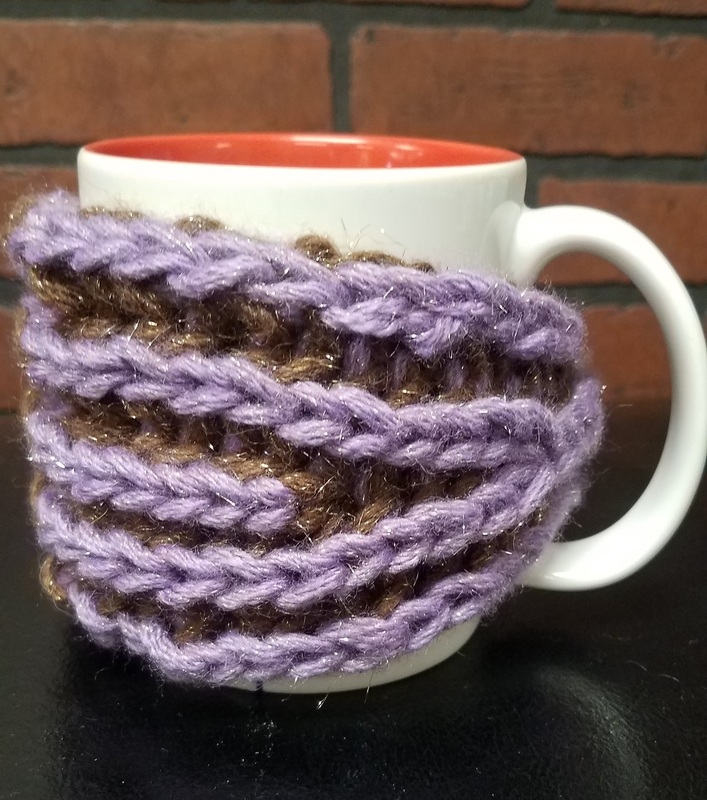 In this class w will learn the Tunisian Simple Stitch, Tunisian Knit Stitch, and the Tunisian Purl Stitch to make fingerless mitts or a potholder. Students will also be introduced to additional Tunisian stitches as time permits to try in class and at home. Hook, yarn and instructional booklet is provided. Please bring scissors and a darning needle. Crochet a rug from alpaca roving, take it home and felt in the washing machine. All materials included- crochet hook, 1 lb. 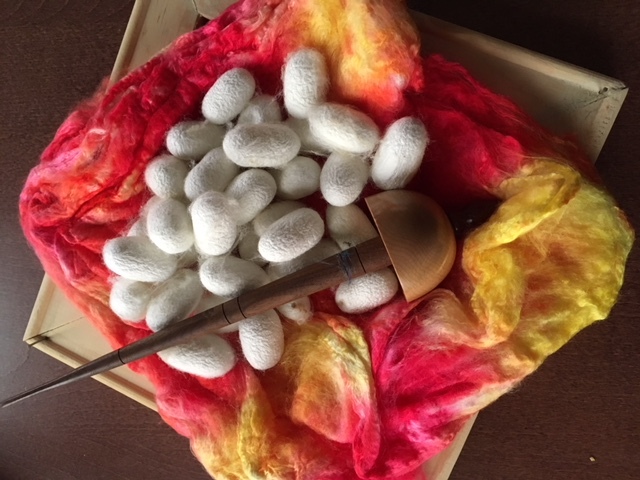 roving, net bag for felting and instructions. 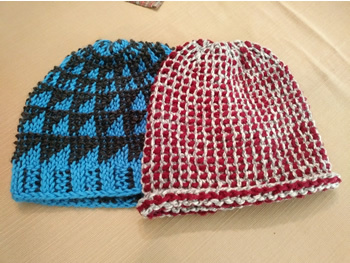 In this class for more advanced Tunisian Crochet enthusiasts, we will learn to make hats or caps in Tunisian Crochet from the top down and from the brim up. We will also learn a color-work technique pioneered by Lily Chin especially for Tunisian in the Round. Hook, yarn and instructional booklet will be provided. Students need to be comfortable working Tunisian Simple Stitch and Tunisian Knit Stitch. Please bring scissors and a darning needle. 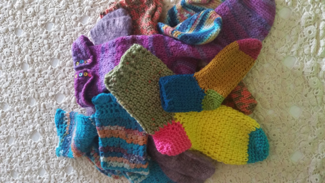 Learning to crochet socks is a whole lot of fun. You don’t need many supplies and the best part is that it’s a portable project. You can crochet socks almost anywhere. Socks can be intimidating at first by they are not hard. Each step will be explained in detail and I will be there to help throughout the process until you feel comfortable. We will also be creating a foot template for you to help with that perfect fit. Handouts and yarn will be provided. Students must know basic stitches. You will take home a sock as a sample. Students are to bring a size D and E hook, and a pencil or pen. Flowers, curls & sparklies, what more could a girl want? 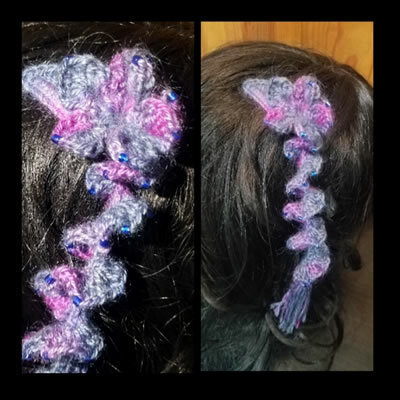 I’ll share my pattern for this sweet crocheted barrette and teach a few different stitches including adding beads without pre-stringing them. I’ll provide all the materials. You just come join the fun! 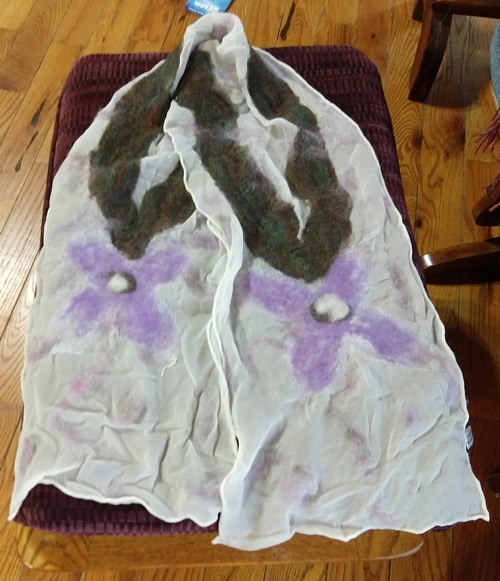 You will dye a silk scarf using colored permanent sharpie pens and spraying with 90% alcohol to transfer the design to the scarf. All materials are provided. 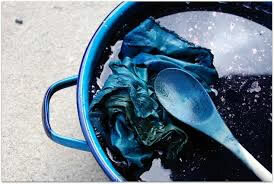 Students will receive an introduction to color theory, dye safety, and various dyeing techniques. Students will be given the opportunity to practice techniques on a sock blank. Students will leave with at least 1 finished sock blank. 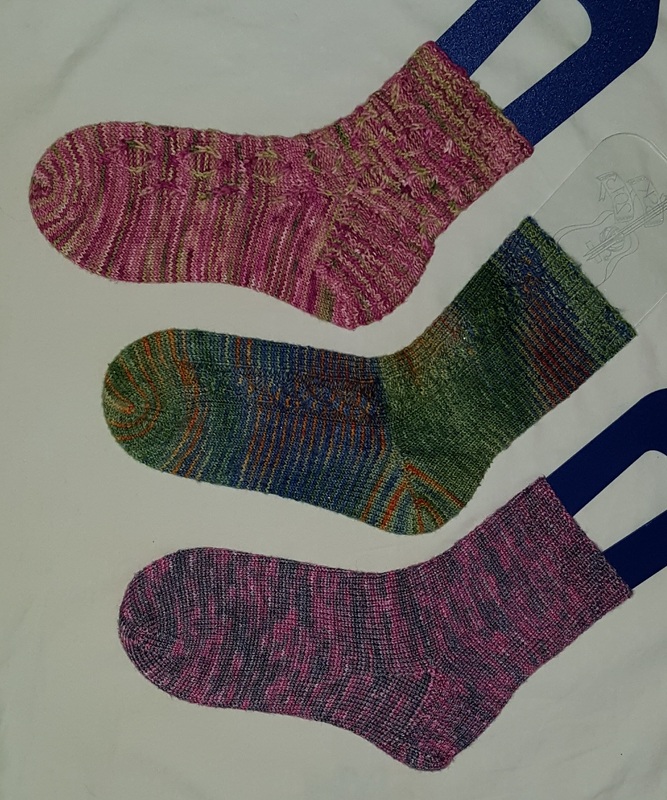 Materials provided, additional sock blanks available for purchase during class if time allows. Join us to learn about the magic of these historical dyes that change color before your eyes. 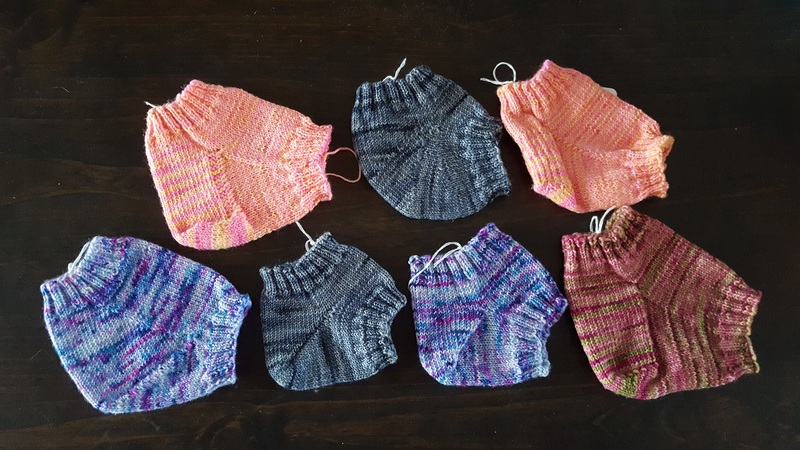 Each student will take home yarn samples, fabric samples and a pair of shibori dyed socks, but everyone is encouraged to bring small samples to drop into the dye pot. Students should wear old clothes and/or a dye apron. 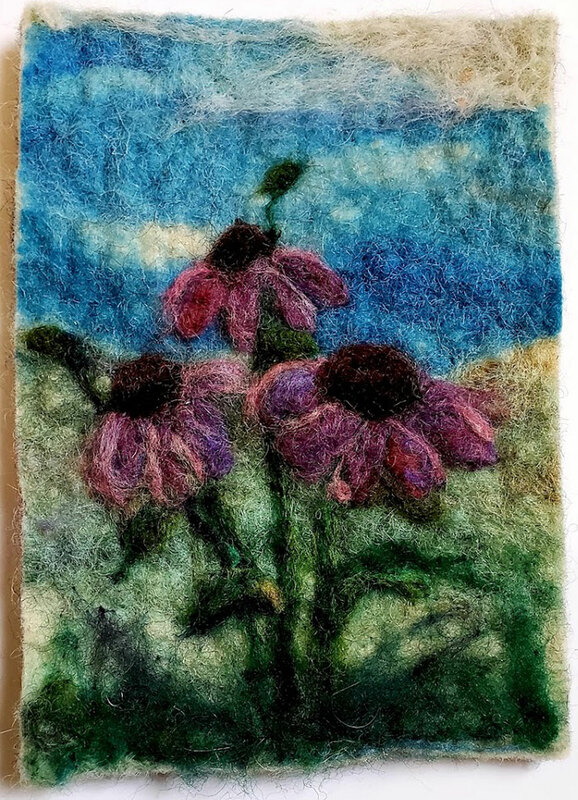 In this class you will learn how to make a 4 x 6” wool picture starting out using the wet felting process where you will make your own piece of felt. While it is drying we will learn how to needle felt on a prepared piece. Then you will show your expertise on your own piece you made. You will go home with two pictures. 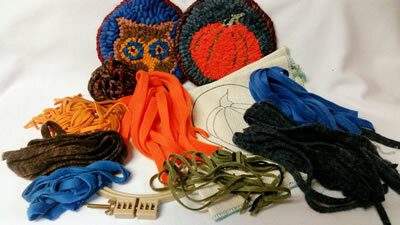 In this class you will be designing and felting your own tote bag or purse. There will be a variety of colors to choose from. Students will gain basic knowledge of needle felting and will complete a Tote bag in class. All supplies are yours to keep after the class and you will go home with a finished product. Come join the class for a fun and educational time. You will leave knowing more than when you came. 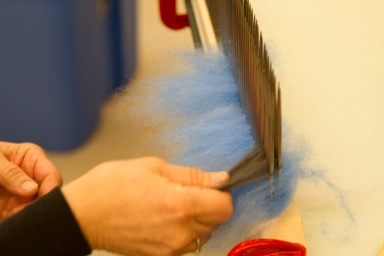 You will be applying woolen fibers on a piece of denim fabric using the felting needle. 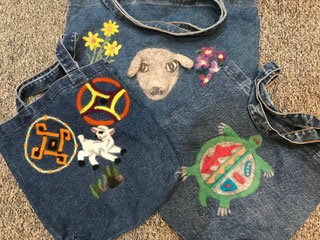 For this class you will be doing a pattern on a canvas/denim bag. You can use many formats to create your own personal design: bring a page from a coloring book, a cross-stitch pattern, any form of design you wish to re-create on your bag and bring two copies of your design on 8-1/2 x 11 paper. I will have designs for you to choose from also. A canvas/denim bag, all fibers an needles will be provided. The piece will then be wet felted at home in your washing machine. Directions will be provided. 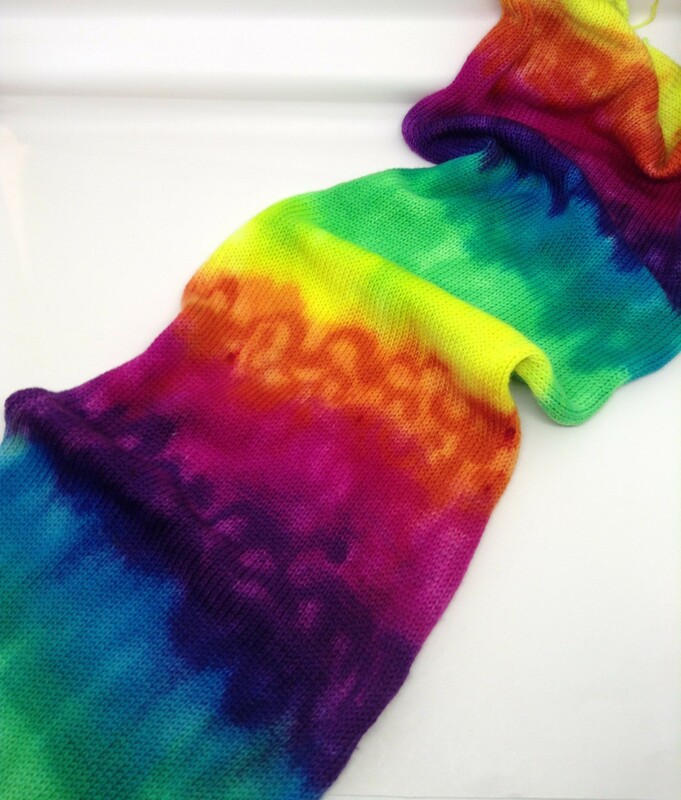 We will be making an open work felted scarf. All material will be provided. Students should bring a large bath towel and their creativity. (Flock to Finish #5). 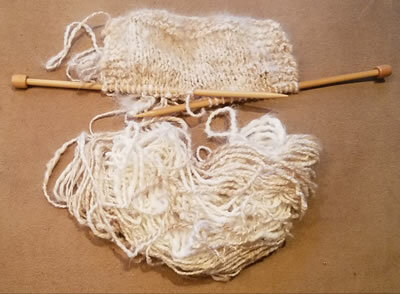 Students will learn how to knit with handspun yarn. 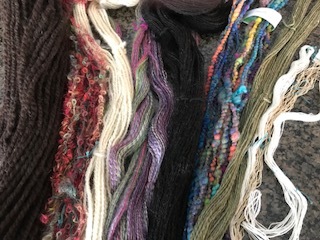 Class will include cast on, cast off, knit and purl stitches, and how to accentuate the unique qualities of handspun yarn. Nalbinding is an ancient craft of fabric making done with yarn and a blunt needle; it is how people created fabric before knitting was invented. This craft dates back to Coptic Egypt, around the 4th Century, and may date back as far as 4,000 BCE in Israel. It is done all over the world, and many people still use it. Nalbinding has been found in Viking digs as well. In this class students will learn two basic stitches, how to start and how to finish a project. Instructor will demonstrate increasing and decreasing and how to pivot (turn a corner). Instructor will also discuss how to read charts and give a very brief Nalbinding History. All supplies and handouts will be provided. Students will take home a mug rug. Some knitters believe that socks should be knit cuff down while other knitters will argue that toe up is the best. We will look at what are the advantages and disadvantages of each style. 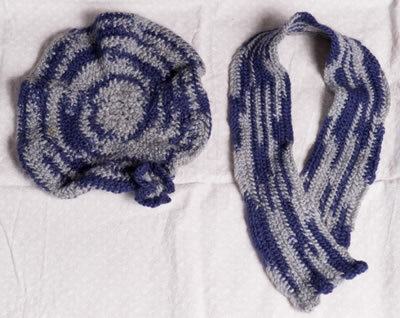 We will briefly discuss some popular cast on and bind off (finishing) for both styles. Ever knit along and run into problems? In this class we will look at knit and purl stitches and how to drop down and fix a stitch that is the wrong one. What is a life line? How do you add one to your knitting? We will discuss and thread one. We will also discuss and execute how to frog and tink. For this class I am asking for a little homework. Please knit up an 8 x 8 square in a light colored worsted yarn but don’t bind off. 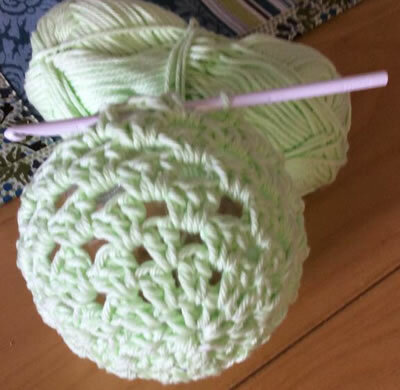 Also bring a crochet hook (about an F size) to learn how to run a stitch back up. 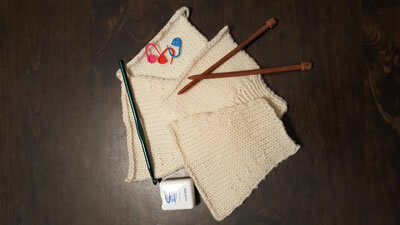 Almost lost dishcloth is simple to knit for newer knitters. 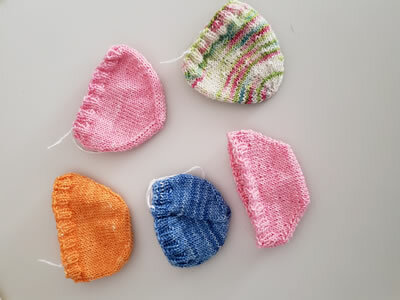 Students will be working on the mini dishcloth in class. You will expand your beginning skills to learn increases, knit 2 together and turning your work. Students will get a pattern for the mini dishcloth and the regular size dishcloth. Students should know how to knit, purl and bind off. Bring 7 or 8 straight knitting needs. All yarn will be provided. We will look at a variety of heel shapes including short row, fleegle, strong heel and a traditional heel flap with a heel turn and gusset. We will discuss how they fit and why you might choose one over another. Also looking at which work for cuff down and toe up. We will look at a variety of sock toe shapes, while discussing how they fit. We will also discuss why you might choose one over another for the best fit. There will be toe up as well as cuff down sock toes. Brioche is a technique that is a bit different than what you may be used to. There are some new stitches that are variations of Knit, Purl, and Yarn Over. Each student will receive yarn, a pattern, and Instruction material. Students will need to bring size 10.5 16-inch or longer circular needles. We will card luxury batts using silky fibers such as suri alpaca, silk, tencel and bamboo. 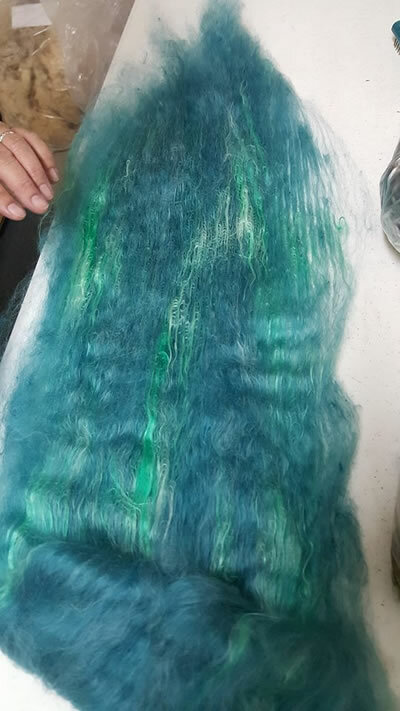 We will go over prepping long locks for carding into a smooth batt and how to blend on the drum carder. Students should bring their drum carder with them if they desire. 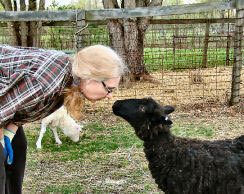 A few years ago we retired from our corporate jobs and started a small farm with just a handful of sheep. If you are thinking of doing the same, we have a lot of information to share with you! In this discussion-style class we share our experiences and advice on the operational aspects of running a small farm, from being total beginners to having a healthy established flock. You can learn from our mistakes and our successes. Topics include: pasture, fencing, shelter, feed, protections, transportation, bio-security and parasite control (Note that ours is not a breeding farm. We discuss bringing in sheep from other farm, but not lambing or breeding issues). All my life I have heard the saying that styles come back around. Some have and some haven’t. This style certainly has. 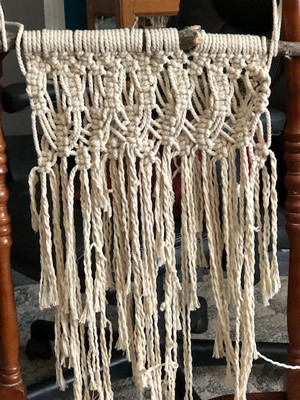 Everywhere we look we see decorative wall hangings made of jute and macramé. I made many as a young girl in high school They are fun, decorative and even useful. In this class we will explore some current wall hanging ideas. I will provide a frame to make your project on, jute, instructions sheets and embellishments. All you need to bring is a strong set of scissors and at least an 8″ long ruler and a stick if you wish to do your project on one. Please join us for this fun class creating something beautiful to put on your wall. Want to blend different fibers but don’t have the resources for a carding machine? Or maybe you would like a bit more of a novelty blending? Possibly you prefer spinning from a pencil-type of roving, better known as a SLIVER? There are unique ways to blend fibers and/or colors on a hackle for different effects. No matter what your reasoning, come and experience the pure, simple pleasures of blending those fibers with a hackle. Students should bring their own hackle, or they can get a discount purchasing one from the instructor. For beginners and more experienced rug hookers alike. 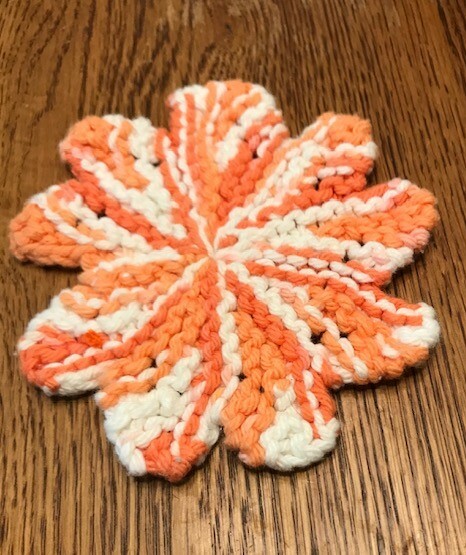 In this class we will practice basic rug hooking techniques as well as proddy flowers, standing wool circles, and beading. We’ll also use a variety of materials to hook our designs. Come learn a modern twist on an old craft! (Flock to Finish #1) Do you have a small number of sheep? Can’t find a shearer? Maybe you don’t have sheep but want to see where your wool comes from? I will show you how to get your sheep “nekked”! I will use hand shears and a shearing stand. (Note: this class will be outside under a canopy). (Flock to Finish #3). In this class you will learn how to wash wool, not just one way but 4 different washing methods. Students should bring an apron to keep their clothes dry. (Flock to Finish #2) Farm flocks are one of four types of sheep operations in the US. The wool is undervalued by most, as it contains parts of the environment where the sheep were raised. 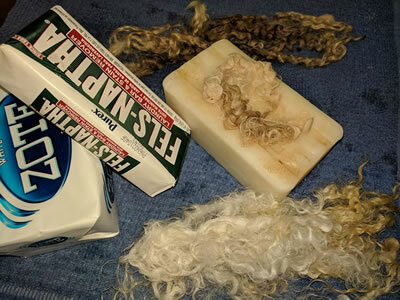 Students will learn how to utilize and get the most out of farm flock fleeces. 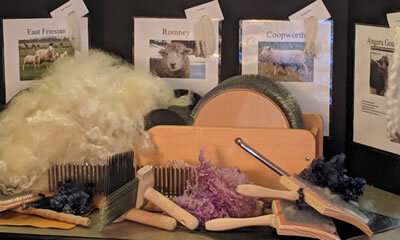 We will look at the different classes of wool and determine the best way to prepare your wool. 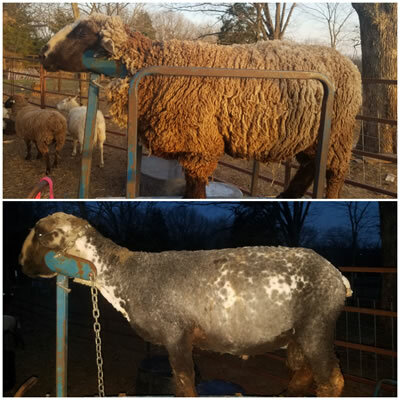 We will be hands on with 6 different types of fiber equipment to prepare your wool and discuss ways to provide specialized products with farm fleeces. 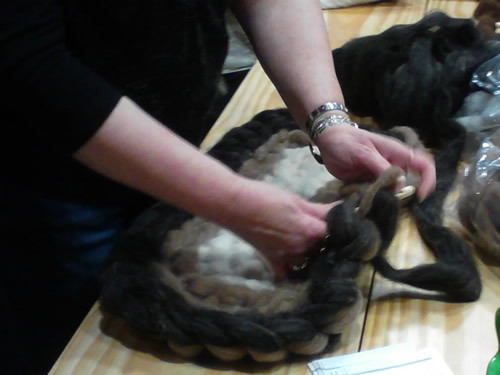 This class is geared toward both fiber artist and sheep grower. Bring samples of your fiber! Business people, no matter what they do, want to be successful, and one important facet of that equation is marketing. It doesn’t matter if you are just starting out or have been doing it a long time, there will always come a time when things slow down. 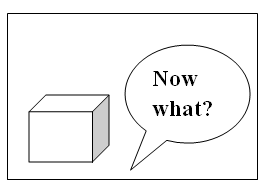 This class will enlighten you through discussion and Q&A’s some insightful ways to approach marketing your product or service by thinking outside “the box”. 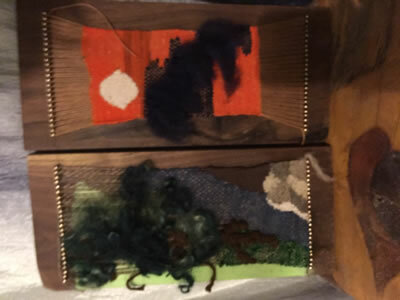 While many of the examples in class will be geared to the fiber artists and their products, the process can be applied to anything so please join us. (Fiber to Flock #4). 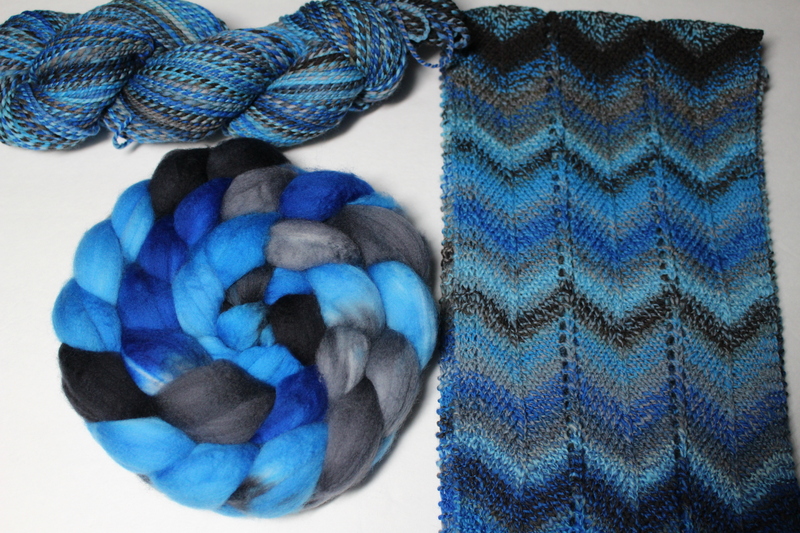 Learn to spin all the pretty fibers you see everywhere. 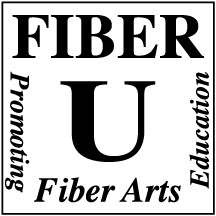 We will learn the basics of spinning, different preparation methods and techniques for spinning the fiber you want. I will have wheels to rent for $10 or bring your own. Learn 3 basic support Spindles of the World and keep the one you like the best to take home. This is our most popular class! We will practice the Navajo-inspired Southwest Spindle, the Tibetan spindle and the Compromise Russian Spindle. 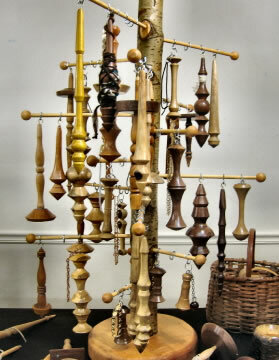 All the spindles have a non-traditional hook at the end, making them easy to learn and use. All materials and equipment. In this class participants will make Bombyx Silk Hankies (Mawata) from silk cocoons and then spin hankies into yarn. Students will need to have a spinning wheel in good working order and feel comfortable spinning on this wheel. 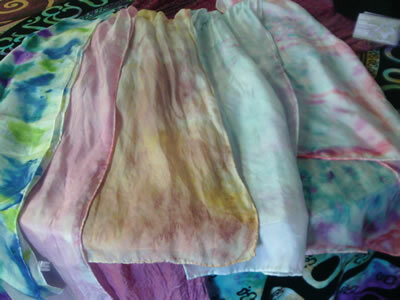 Information on how to dye hankies and other applications for using hankies will be included in this class. All materials – Bombyx cocoons, hankie frames, and hankies- will be provided. In this class students will learn how to use concepts or pictures as inspiration to create a unique art yarn. We will work with color, texture, design and add-ins. 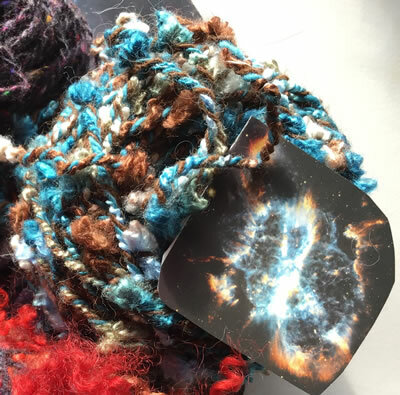 Each student will explore their own inspirations to spin a yarn that will be a work of art! Students will review layering techniques to create new textures and plying styles. We will talk about ‘how to be inspired’ using color, texture and add-ins. We will work with a design card to help fix our inspiration in our minds. We will then take our concepts and what we have learned to create a work of art. Homework: Students should have at least one concept/inspiration in mind that they’d like to spin. Can be a concept (a season, a Holiday, an emotion, etc.) or a picture. 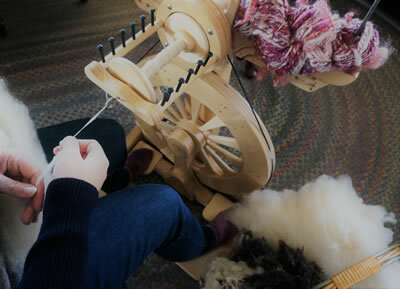 If you have something special that you would like to spin into your yarn, bring it along. You should bring a working wheel, 4 bobbins, lazy kate, niddy noddy, ball winder, hand cards, a tapestry needle, a small pair of scissors, your homework, labels for sample yarns and something to write with. I will have a variety of fibers, threads, fancy yarns and add-ins for students to choose from and a handout will be provided. Learn the theory of fractal spinning; choosing fiber to yield the subtle color shifts; how to divide the fiber for spinning. Students will see examples of fiber, fractal spun yarn and finished products. Students must know how to spin a single and create a 2-ply yarn. Bring your wheel or spindle. Four ounces of hand dyed fiber and a handout will be provided. Fat yarns, fine yarns, smooth yarns, fluffy yarns…can you break away from your “default” yarns? Take control and spin the yarn you want, when you want them. Much control comes from understanding wheel mechanism, the rest is up to you. You can do it! Do you want to weave but don’t want to spend the money on a loom and all the supplies until you know if weaving is really for you? 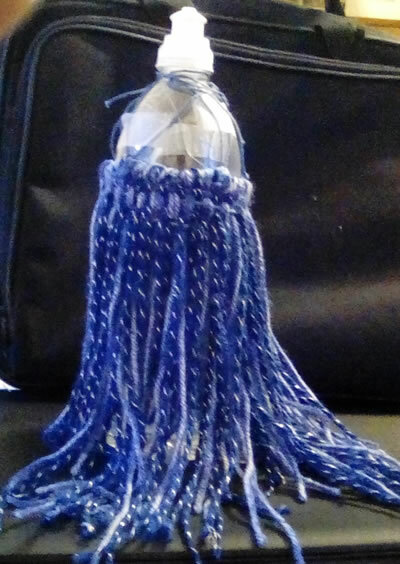 Join us in weaving a small pouch type bag using only a water bottle, yarn and scissors. We will be making a small bag suitable for a cell phone or money and credit cards using a 20 oz water bottle. This class is for all levels of weaving from beginner to advanced. It will give you an introduction to Saori Style weaving on a small format using a Jewel Loom. Saori is unique and totally different from other traditional styles of hand weaving. Saori is an art form in which we express our true selves in weaving. This small scale loom experience can be transferred into traditional weaving as well. With Saori you weave from your heart and there are no mistakes. With this smaller format you can explore with little effort or loss of materials. All material will be provided and the loom is yours to take home. (Additional looms can be pre-ordered at $10). Students may also decide to bring scraps of hand spun, ribbon and beads you treasure and maybe even an old piece of jewelry as a focal point. Students will be weaving a basket that has a round cedar base. The spokes will already be inserted in the base so the weaving fun will begin quickly. You will be able to choose your own colors. 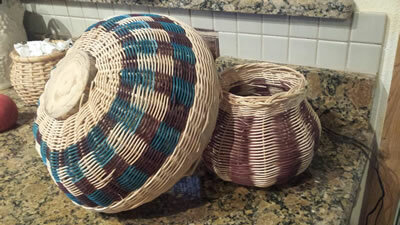 Depending on how you shape the basket will determine the final look of the basket. You will notice 2 different styles in the picture- both were woven by the same person with the same starting pattern. Give weaving a try! No experience necessary. Create different looks by using color- it’s easy and oh so fine. Everything is provided, so join us! 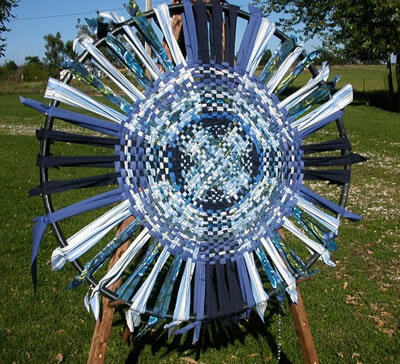 There are very few rules in weaving that can’t be broken. In this class students will be able to break most of the rules and design a pictorial weaving on a 6 x 10” loom that fits their personality. 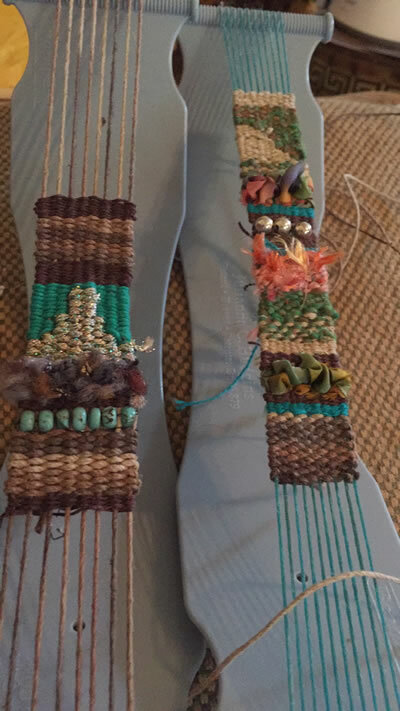 This class is perfect for those that are intimidated by traditional warping and weaving rules. All supplies are provided and students get to take home the loom. Learn this magical technique for creating triangles, squares or rectangles of woven fabric using a frame loom that can be joined together to make shawls, scarves, pouches, rugs, pillows, etc. Bex’s mother wrote THE book on this method. No measuring, warping, or math needed for this class. Finish a complete project in 3 hours. Try our popular washcloth loom, weave a triangle and a square on our 6” mini mod looms that can be combined for amulet bags, or try a cell phone bag on our smallest rectangle loom. 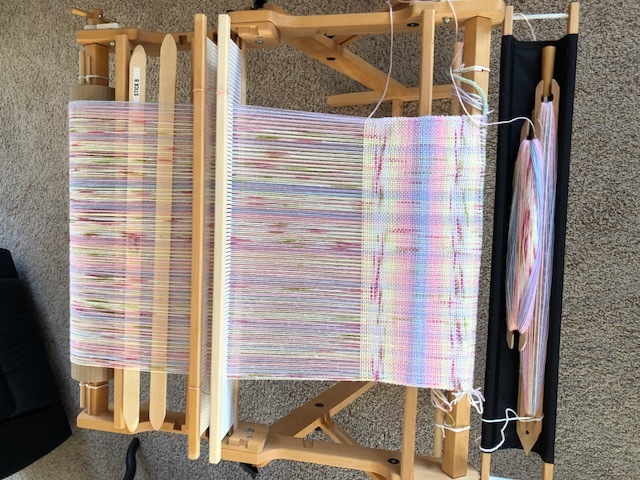 This is a great way to learn more about continuous strand weaving with no initial investment in the loom or equipment. Class fee includes use of looms and tools, basic materials, written handout and instruction. Students who purchase their loom will receive a $10 discount at time of purchase. A warm, woolen scarf is not that welcome in July, but I have it on good authority that winter will come again! In this class, you will learn the American Indian art of fingerweaving–weaving cloth without a loom. 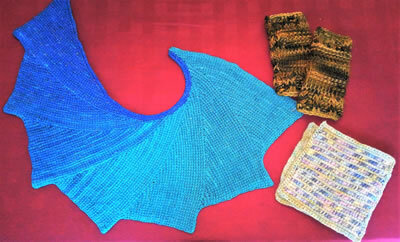 You will be taught the versatile Chevron weave, and be working with wool yarn from Brown Sheep Yarn Company. It is one of the few yarn factories left in the United States. You will not be able to complete your scarf in the class time provided, but you will have the knowledge to do so. A booklet on fingerweaving the Chevron design is included. 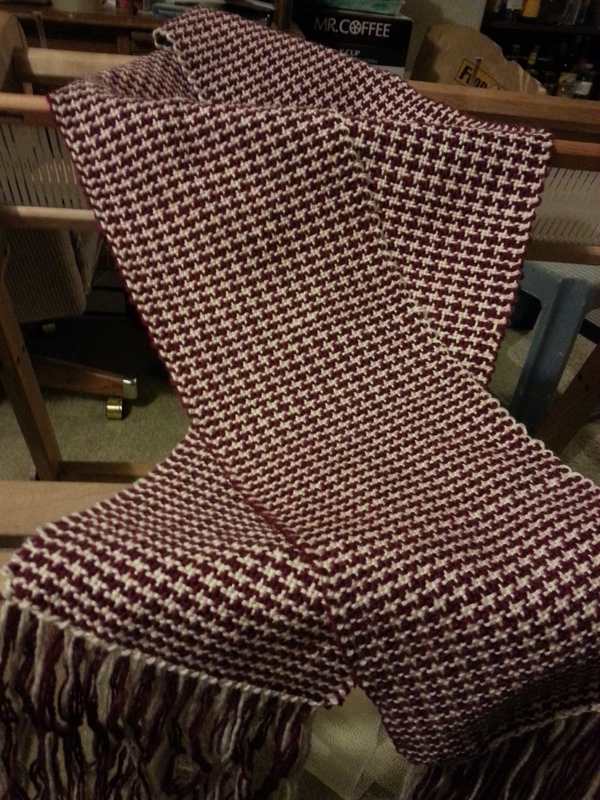 Learn to warp your rigid heddle loom with two heddles to make a tea towel, incorporating pickup stick patterns. 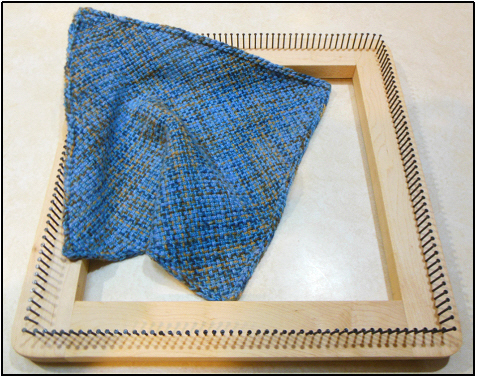 Students need a rigid heddle loom with the ability to use two heddles (some come that way, others need to purchase a heddle block kit), two pickup sticks at least 13 inches, two shuttles, warping peg, and warp paper. Instructor will provide all other materials.